Most of us have been or heard of cave tubing in Belize, right? Hop on an inner tube at the mouth of the Crystal Cave and let the river’s currents take you through the Mayan underworld. But have you heard of Island Tubing? It is one of the newest adventure tours available at Caye Caulker by Anda De Wata Tours. You will love it! 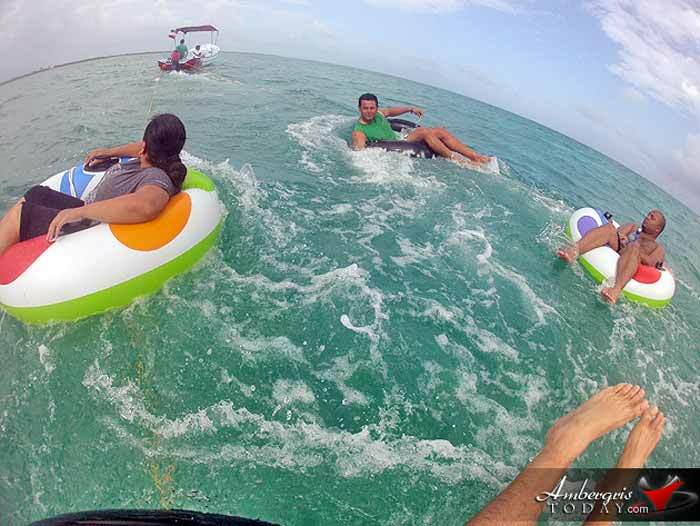 The concept is simple, string eight inflatable tubes behind a skiff and drag along a party through the warm waters of the Caribbean Sea and enjoy island life at its best. Anda De Wata Tours invites you to take a break from looking at the beautiful corals and snorkeling with exotic marine life and just snug yourself inside an inflatable tube while they tug you along the front and back shoreline of the island. is drifted your way by means of a surf board! Awesome, isn’t it?